Snacking is worse for your health than three big meals a day, warn researchers. They found snacking on high-fat and high-sugar foods increased abdominal fat and fatty liver, but eating larger portions did not. The Dutch study claims to be the first to investigate whether eating many times a day is more damaging to health than having regularly big meals. It found a high-calorie diet with frequent meals increases cholesterol stores in the liver and fat around the waist, but increasing meal size did not. 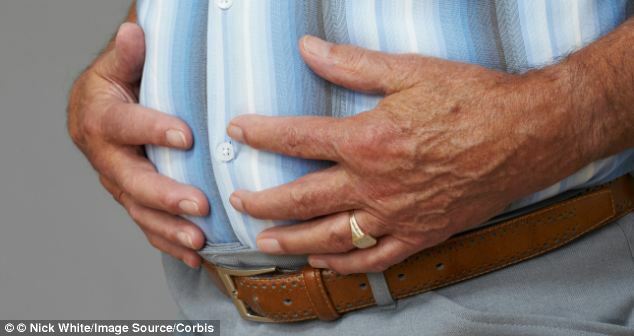 Previous research has linked obesity to the accumulation of abdominal fat and fat in the liver, making non-alcoholic fatty liver disease (NAFLD) one of the fastest growing diseases of the liver. Study leader Dr Mireille Serlie, with the Academic Medical Centre Amsterdam, in The Netherlands, said: ‘Our study provides the first evidence that eating more often, rather than consuming large meals, contributes to fatty liver independent of body weight gain. In countries like the U.S., children consume around one-quarter of their daily calories from high-fat and high-sugar snacks. In the study 36 lean men were put on a high-calorie or a balanced diet for six weeks. Researchers measured fat in the liver and abdominal fat using magnetic resonance imaging (MRI) and insulin sensitivity before and after the diet. Those subjects on the high-calorie diet ate three main meals along with additional calories from high fat and/or high sugar drinks, with or in between meals, to increase meal size or meal frequency. Results show that high-calorie diets led to weight gain, says a study published in the journal Hepatology. Eating more frequent meals significantly increased fat in the liver, while larger sized meals did not. Researchers found that belly fat increased in the high-fat/high-sugar frequency group and in the high-sugar-frequency group.